Perhaps the most important temple in the city of Lampang is Wat Phra Kaeo Don Tao, the temple of the Emerald Buddha. The temple was home for 32 years in the fifteenth century to Thailand's national symbol, the Emerald Buddha, now housed in its own temple inside Bangkok's Grand Palace. 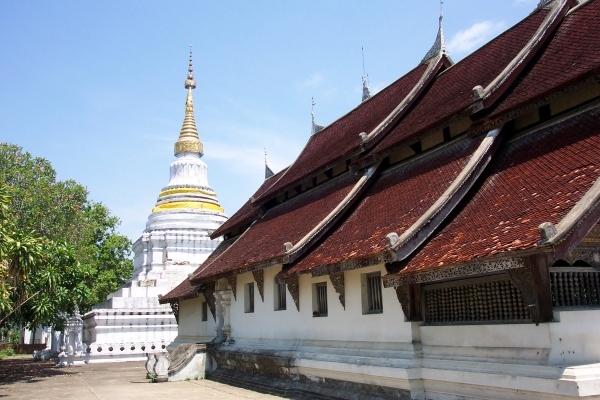 The temple, and in fact the city of Lampang itself, is said to have been founded by the son of Lamphun's founder, Queen Chama Devi, in the seventh century. 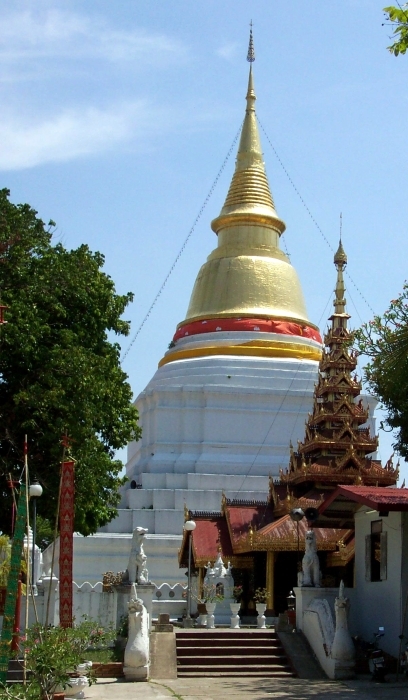 The 50 meter (165 foot) chedi (pagoda) is the only structure that survives of the original temple. In front of the pagoda is a Burmese styled open prayer hall built in 1909 by Burmese immigrants at the request of a Thai prince. In the fringe of trees behind the chedi is a statue of an elephant with a small sort of pavilion on its back. The statue commemorates an event in the legend of the Emerald Buddha image. The image was discovered early in the fifteenth century when lightening cracked open the chedi in Chiang Rai's Wat Phra Kaeo. After its discovery, the King of Chiang Mai sent some troops with an elephant to bring the image to Chiang Mai. But, as the story goes, the elephant refused to take the road to Chiang Mai and ended up in Lampang instead. The Emerald Buddha was allowed to reside at the temple for 32 years before it was finally 'convinced' to be taken to Chiang Mai, where it resided in Wat Chedi Luang. Elsewhere in the compound is a rather decrepit museum of Lanna culture. Some china and woodcarving is on display. South of the main courtyard of Wat Phar Kaeo Don Tao is a small, elegant and mostly abandoned temple called Wat Chadaram, or Wat Suchadaram. The remaining buildings include the unusual pagoda, which is fronted by a distintive wooden chapel, and another wooden building, the ubosot (ordination hall) on a raised plastered platform. The wiharn features beautifully carved roof brackets and turned wooden spindle windows. The building is locked, but you can peer through the front windows to get an idea of the interior decorations, which appear to be quite fine as well. The details of the ubosot (ordination hall) are even finer, but it too is locked. Admission to Wat Phra Kaeo Don Tao is 20 Baht (0.52 USD) per person.